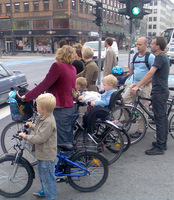 Conflicts will arise where different modes of transport share the same space. Junctions by their nature are particularly susceptible to conflict. The relative speed, direction and mass of cyclists, pedestrians or vehicles will determine the severity of the outcome of an actual conflict. Awareness of potential conflict and addressing it through a legible design is fundamental in providing cycling facilities. 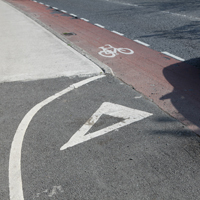 Through legible design, all conflicts will then be obvious to all road users in advance, and the resolution of each conflict will be mutually understood by all road users. Conflict Management is a form of Risk Management. The four steps below are adapted from the standard approach to Risk Management. Some or all of these steps will also form part of the Road Safety Audit process. Review the junction or situation to identify possible conflict areas for all different modes of transport. What is the “actual” usage pattern of the road as opposed to its Function and Design – especially regarding inappropriate speed, position and direction? Standard hazards such as horizontal and vertical clearances, street furniture etc. Where potential conflicts are identified, determine how likely they are to occur and how severe the outcome might be. Are previous accidents likely to recur? What is the likely worst outcome? Potential conflict can be addressed by Removing, Reducing or Accepting, but also by Management. The final step in the conflict management process is to monitor the effectiveness of the design measures implemented.